Are you getting some spam Facebook messages from unknown? Do you find that your Facebook account is hacked? Don't become a victim for any type of Facebook virus. Before entering into how to get rid of Facebook viruses, let us find out what actually is it. What is a Facebook Virus? 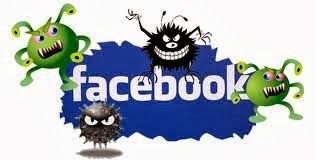 Facebook virus is a dangerous social media parasite, which infects your systems when you visit Facebook account. What gets affected due to this? Once it gets its way to your system, it calls for cyber criminals to hack Facebook accounts. Other than this, it also spreads to victim's contacts infecting them too. Any sensitive information that is stored and made private is hacked from computers and your Facebook account too. Other than destruction, it may hack your system by stealing your personal data like your bank passwords, data, etc which are very important. Then write a status update alerting your friends that you clicked on a bad link and had a Facebook virus. Tell your friends not to click on any links that appear to be from you (then refrain from posting any links for a while so people don’t worry about which links are good or bad). Later on check to be sure the application isn’t lurking on your account. In all this, only the password is one important thing that really matters. So change your passwords frequently and try to change it in every 2 or 3 months. Whenever you find a new Facebook app, before using, it normally asks for your permission to post on your timeline and also use your contacts to post to. It is your responsibility to give access or not for any Facebook app. Because some apps are just time wasting and they are not needed on your timeline. Facebook is for getting connected to our family, friends and colleagues, not for virus, bugs and hackers. So be aware from all these cheaters.